When it comes to finding the right case to protect your iPhone, there are two main approaches. Some people just buy whatever Apple sells at the Apple store, some look for pricey cases that they can use to show off, and some look for cheap iPhone cases since they just spent so much money on their iPhones. If the third option sounds like you, you likely have already come to the realization that a clear case is the best way to get an inexpensive case that looks great because it shows off Apple’s iPhone design. 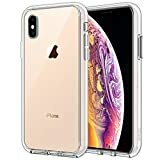 The JETech iPhone X Clear Case is a great option, offering sturdy hybrid protection with hard polycarbonate on the back and grippy TPU on the sides. And best of all, it only costs $3.99 right now on Amazon.